Ensure the safety of users is central to the management of a road tunnel. 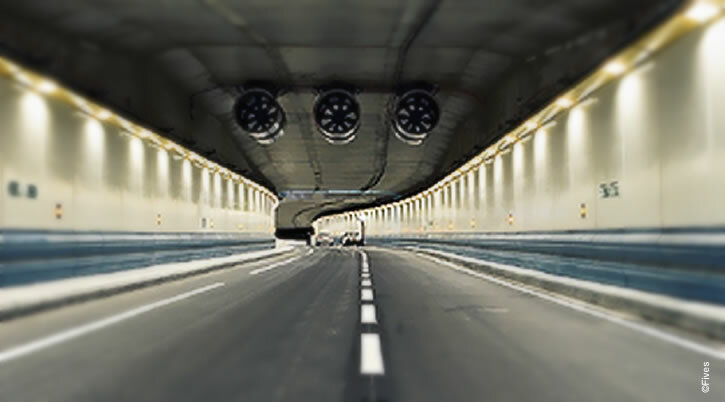 Thanks to a strong experience and expertise in ultimate combustion solutions, Fives offers the most advanced control and detection instruments to the road tunnel operators. In road tunnels, security is critical. Detection and control are the starting points to reduce risks and make the appropriate decisions when needed. The sources of dangers are numerous, and the faculty to control in continuous each sources is essential. To face these stakes and improve the security for users and operators, tunnel managers require accurate, highly reliable and ultimate detection and control systems, in compliance with tough regulations. A historical leader in the combustion, Fives offers the best-in-class technologies of control and detection in tough environments. With the Pillard range, Fives brings precise control solutions for gas, dust, smoke and wind. Fives designs gas detectors, able to measure in continued, thanks to the latest technologies of electrochemical cells. Thanks to Pillard dust monitors, Fives ensures the most accurate measure and continuous control of dust along with the elimination of fogs. Fives offers smoke detection solutions, with low maintenance, detecting with high accuracy all abnormal smoke thresholds. Able to measure the sound propagation in measuring the displacement of an ultrasonic wave, velocity and direction of the wind, Pillard WindCheck is the ultimate solution.